*Use with caution: PE 2007/08; YK 2007/08; NT 2007/08 and 2011/12. **This variable is based on the Canadian Community Health Survey (CCHS) Food Security module, a set of 18 questions, and indicates whether households both with and without children were able to afford the food they needed in the previous 12 months. A full household measure of food security was based on all 18 questions, with separate adult and child measures being derived from 10 questions about adult food security and 8 about child food security, respectively. Note that percentages for the household and adult measures are calculated using the whole sample as the denominator, whereas percentages for the child measure have only households with children under 18 years as the denominator. Source: CICH created graphic using data adapted from Statistics Canada. 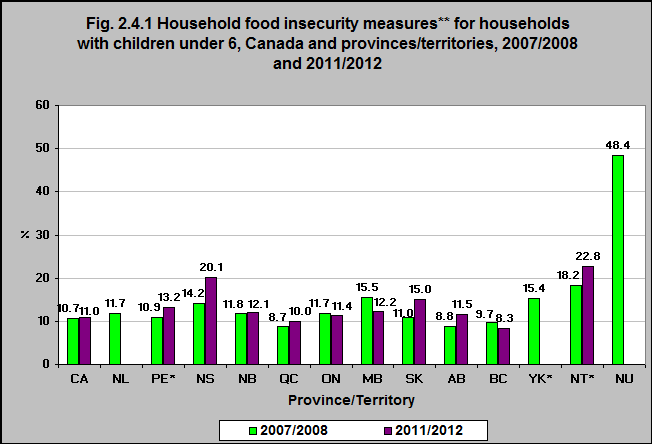 Table 105-0546 – Household food insecurity measures, by presence of children in the household, Canada, provinces and territories, occasional (number unless otherwise noted). http://www5.statcan.gc.ca/cansim/a26?lang=eng&retrLang=eng&id=1050546&paSer=&pattern=&stByVal=1&p1=1&p2=49&tabMode=dataTable&csid= – accessed July 20, 2017. The rate of food insecurity in households with young children under 6 in 2011/12 ranged from 22.8% in the Northwest Territories to 8.3% in British Columbia. 1Statistics Canada. Table 105-0546 – Household food insecurity measures, by presence of children in the household, Canada, provinces and territories, occasional (number unless otherwise noted). http://www5.statcan.gc.ca/cansim/a26?lang=eng&retrLang=eng&id=1050546&paSer=&pattern=&stByVal=1&p1=1&p2=49&tabMode=dataTable&csid=– accessed July 20, 2017.